The aim of the project is to develop a new process for the treatment of greywater by a combined biological and advanced oxidation process. Sequential batch reactor (SBR) and solar photocatalytic reactor (SPCR) was used respectively for the degradation of pollutants by biological method and by advanced oxidation process. The developed technology can be used for the effective reuse of greywater at the community level and multistoried residential buildings to effectively reuse the greywater for gardening and groundwater recharge. 1.Kumari Priyanka, Manaswini Behera, Remya Neelancherry, Evaluation of performance for the treatment of low strength greywater using sequencing batch reactor, 11th International Conference on the Challenges in Environmental Science and Engineering (CESE-2018), 4 to 8 November 2018, Bangkok, Thailand. The soft drink industry in India is growing at the rate of 5 to 6% annually. The soft drinks are available in two distinct segments i.e., cola drinks and the non-cola drinks such as soda, clear lime, cloudy lime and drinks with orange and mango flavours. Soft drink industries extract a great portion of groundwater, adding pressure to the water scarcity issues. On the other hand, these industries suffer inadequate handling of their product losses generally considered as wastes. Those products contribute to the wastewater organic load augmentation and cause fastidious environmental impact. The current practices of the soft drink beverage industry wastewater is either time consuming, sensitive to the variations in the wastewater stream and/or produces a concentrated waste stream at the end of treatment process, which has to be handled separately. Therefore, research work was intended to develop a method for rapid and complete treatment of soft drink wastewater. 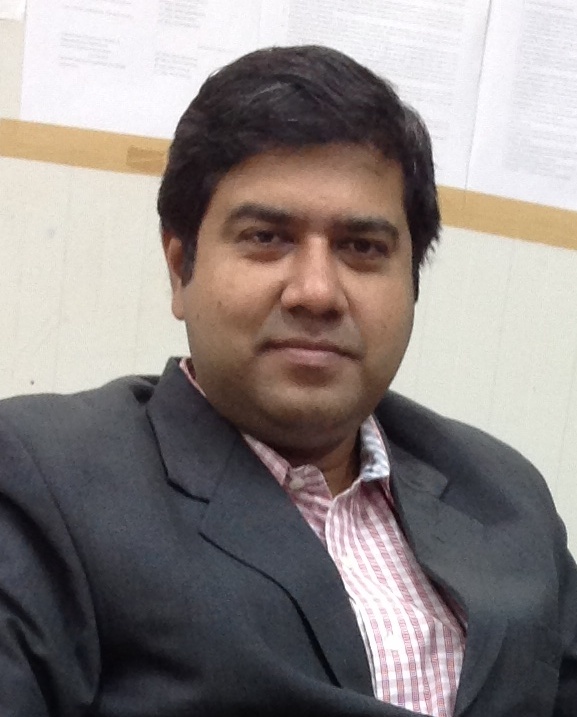 2.Anil Swain, Neelancherry Remya, Analysis of photolytic and photocatalytic systems for the microwave coupled treatment of soft drink industry wastewater�, 3rd Green and sustainable chemistry conference, 13 to 16 May 2018, Berlin Germany. 3.Anil Swain, Neelancherry Remya, Microwave Photolytic Treatment of Soft Drink Industry Wastewater�, Recycle 2018, International Conference on Waste Management, 22 to 24 February 2018, Indian Institute of Technology Guwahati India. The cropping season is classified into two main seasons in India: kharif and rabi. While the kharif season is from June to October, the rabi is from November to March. 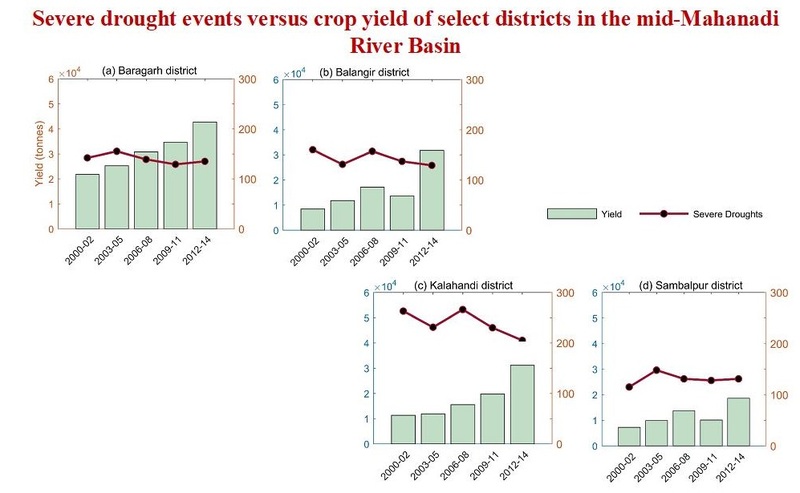 Using a crop water stress indicator, severe agricultural droughts over Mid-Mahanadi river basin were extracted for the two seasons over the period 2000-2014 at monthly scale, at 25° grid resolution. 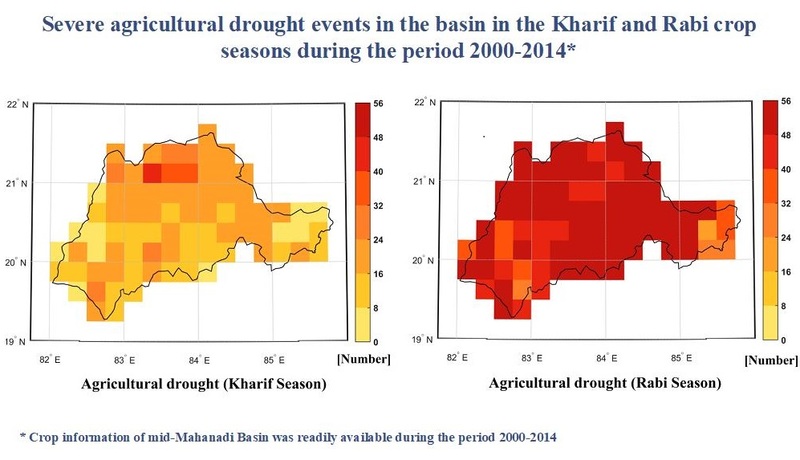 The drought stress indicator built on soil type, crop coverage and remotely sensed surface soil moisture data of the region aids in agricultural drought classification and monitoring. The effect of severe and extreme category agricultural drought events in the region on crop yields of four drought-hit districts of the state of Odisha during the period is also demonstrated. The study was presented in the World EWRI Congress held at Sacramento, USA, in May 2017. In this research project, newly designed natural laminar flow aerofoils are optimized for higher lift to drag ratio which have possible applications in the transport aircrafts. Aerodynamic characteristics of the newly developed aerofoils are obtained using CFD simulations using high accuracy numerical schemes. The process flow of a single representative integrated system (b) the schematic diagram of the designed experimental set-up with all the dimensional details. In a developing country like India, providing reliable and affordable wastewater treatment facilities in rural areas are a huge challenge. With the aim of enhancing the nutrient removal from rural domestic wastewater while reducing the cost of the treatment process, a novel, integrated treatment system consisting of a multistage bio-filter with drop aeration and a post positioned attached growth carbonaceous denitrifying-bioreactor was designed and developed in this work. The bio-filter was packed with 'dolochar', a sponge iron industry waste, as an adsorbent mainly for phosphate removal through physiochemical approach. The Denitrifying bio-reactor was packed with many waste organic solid substances (WOSS) as carbon sources and substrates for biomass attachment, mainly to remove nitrate in the biological denitrification process. The performance of the modular system, treating real domestic wastewater was monitored for a period of about 60 days and the average removal efficiencies during the period were as follows: phosphate, 99.48%; nitrate, 92.44%, ammonia, 96.64%, with mean final effluent concentration of 0.153, 5.5, and 1.06 mg/L, respectively. The multistage bio-filter played an important role in ammonium oxidation and phosphate adsorption. The multilevel drop aeration with increasing oxygenation, and the special media used, consisting of certain oxides were likely beneficial for nitrification and phosphorus removal, respectively, whereas the nitrate was effectively reduced by biological denitrification in the carbonaceous bioreactor. This treatment system would allow multipurpose reuse of the final effluent. Moreover, the saturated dolochar can be used as nutrient suppliers in agricultural practices and the partially degraded carbonaceous substances can be subjected to composting, and subsequently used as an organic fertilizer. Thus, the system displays immense potential for treating domestic wastewater significantly decreasing the concentrations of nutrients and most importantly, facilitating the conversion of the waste materials into usable ones. 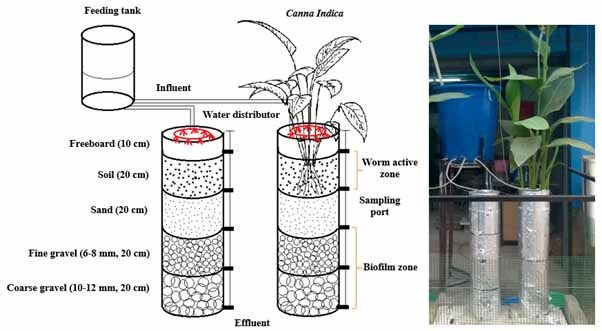 Macrophyte assisted vermifilter (MAVF) is a bio-oxidative process in which detritivore earthworms interact symbiotically with microorganisms and other soil fauna to degrade organic contaminants present in wastewater. Microbes perform biochemical degradation of wastewater solids, while earthworms degrade and homogenize the material through muscular actions of their foregut. Earthworms can exert an influence on soil microorganisms directly or indirectly via comminution, burrowing, casting, grazing and dispersal process. 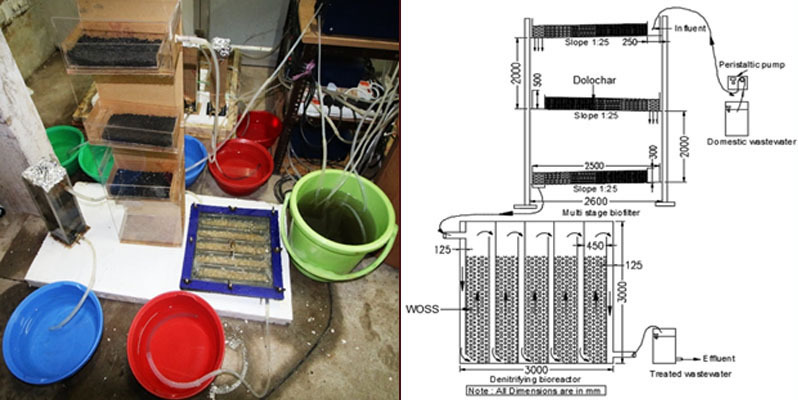 Presence of macrophyte in vermifilter, enhance physical filtration process and organic solids present in wastewater filtered and trapped in the bed for a long time, thereby allowing for better biodegradation of solids. Plant roots distribute effectively on bed and provides natural habitat, which encourages the development of a great diversity of microbial communities. Nutrients in wastewater uptake by the roots and oxygen leakage from root tips create a 1-4 mm oxidation film surrounding the roots, which enhance the aerobic degradation process. Pathogens present in wastewater reduced due to the action of intestinal enzymes (protease, lipase, amylase, cellulase) secreted in the earthworm's body wall and coelomic fluids released from their body cavity (coelom). Root exudates released from the plant also have antimicrobial activity which kills pathogen present in wastewater. Overall, this system requires no skill persons to operate, which is economically affordable and environmentally sustainable. India is planned to develop offshore wind energy in coastal areas. This would include exploiting India's 7,500 km-long coastline for the production of low-carbon energy from offshore wind power. Global warming is expected to change the wind and wave patterns at a significant level, which may lead to condition outside current design criteria of monopile supported offshore wind turbine (OWT). This study examines the impact of climate change on the dynamic behavior and future safety of offshore wind turbine. The time series of future wind speed and wave height at local level is generated using a statistical downscaling model. 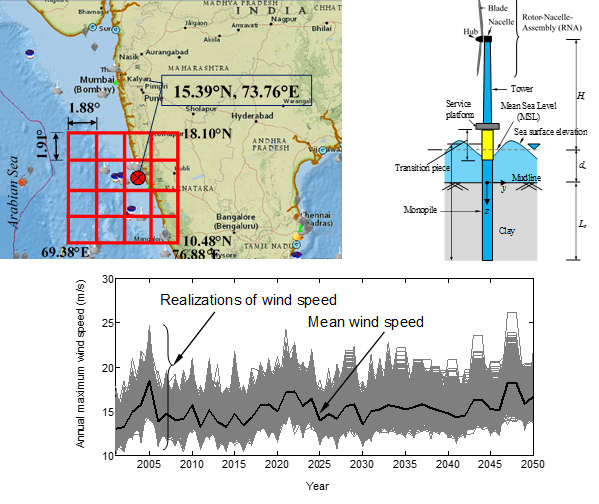 Wind speed, wave height and wave period data are collected from the buoy deployed by Indian National Centre for Ocean Information Services and the future climate for the next 30 year is simulated considering various greenhouse gas emission scenarios. 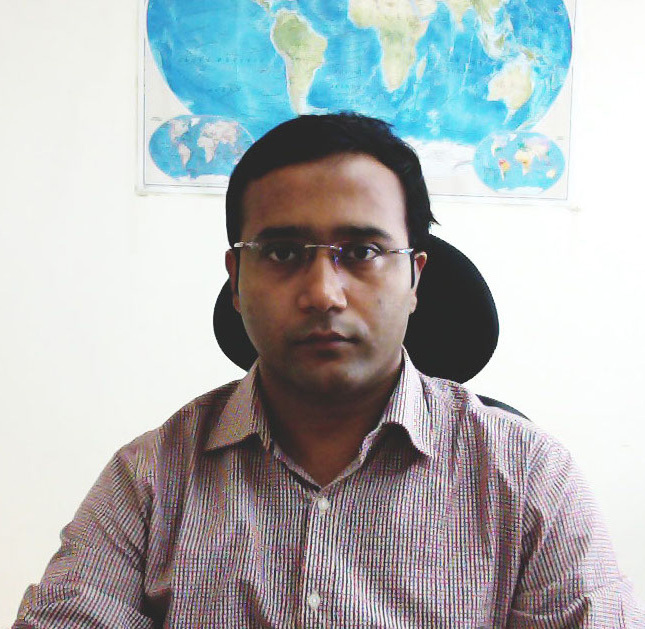 The changes in design at offshore location along the west coast of India is examined considering serviceability and fatigue limit state criteria. This study shows that changes in design of OWT are required due to increased responses owing to the effect of climate change. Fatigue life is found to be decreased because of climate change. These aspects are important for designing of offshore wind turbine. The surface currents along the north-western BoB are characterized to be northward (southward) alongshore flow during February to April (October to December) with peak magnitude of about 1.8 (1.2) m/s. 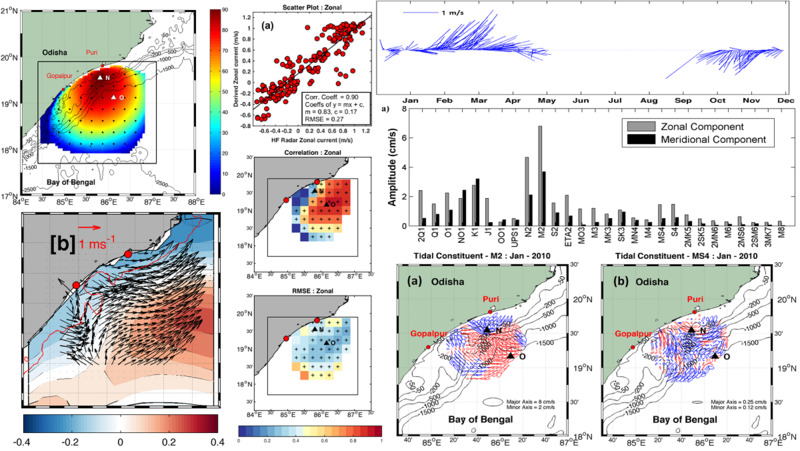 Validation of the High Frequency Radar (HFR) derived ocean surface currents on daily scale and the high frequency tidal constituents have been carried out in the north-western Bay of Bengal (BoB). Diurnal, semi-diurnal and high frequency tidal constituents (shallow water) have been extracted from systematic harmonic analysis of the currents. Among the semi-diurnal tidal components, M2 dominates over S2 and N2, leading to the simultaneous occurrence of a cycle of high and low tides twice. Significant shallow water constituents M4, MS4 and M3 are identified, which are due to non-linear interaction of tidal currents with bathymetry (Mandal et al., 2018). Ocean Circulation Model using Regional Ocean Modeling System (ROMS), a three-dimensional, free-surface, terrain-following model, has been set up for the Indian Ocean to study the intra-seasonal to inter-annual circulation variability (Dey et al., 2017) in this domain. Several sensitivity experiments were carried out to assess the model responses to various air-sea fluxes and the boundary conditions. The model was extensively validated with all observational data. The recent eddy permitting model set up is running with TropFlux (source: INCOIS) forcing and boundary condition from SODA. In enterprise networks (ECN), the correct implementations of security policies are becoming increasingly difficult due to complex and heterogeneous organizational requirements involving a large number of computing and cyber devices. These policies may span from resource health and configuration management to dynamic access control and protection against emerging vulnerabilities and related attacks. The complexity of the problem is compounded due to dynamic change in configurations and network topologies, inter-dependencies between device level configurations, and distributed nature of implementing policies in the networks. In addition, dependencies between network services may introduce hidden access channels which in turn may expose the organizational resources to the attackers. Recent studies show that 60-80% of security vulnerabilities are due to network policy misconfigurations. The manual analysis and enforcement of the security policies can be overwhelming and potentially inaccurate due to high potential of human errors. Therefore, there is significant need of developing tools for formally assessing the compliance between the distributed security implementation and the organizational policies. Asset_Checker: compliance checking of the enterprise resources (hardware and software) based on device level system parameters, drivers, application software and OS versions; related vulnerabilties, risks and patches as specified under enterprise policies/requirements. The key enabler for this module is formal ontology extraction supported verification. Config_verifier: verification of the device level configurations and the distributed network access control implementations with respect to the organizational policies, various security standards and known attack scenarios. Predicate logic based constraint solver is used for modeling and verification engine. It also generates remediation plans based on the verification traces. Auth_diagoniser: diagnosis of conflicts between heterogeneous role-based authorization and resource access policies and its implementations. This will also cover detection of password violations and generation of run time alerts. Network Isolation Enabler: automatic enforcement of separation between network devices or group of network devices (zones) driven by device functionality, exposure (to/from internet), potential vulnerabilities (running software) of the connected hosts and heterogeneous access policies. Configuration based ontology extraction and analysis will be used for enforcement of network isolation. Disposal Manger: automatic checking of the methodology and devices used for disposal of data and resources. Research Domain: Network Security, Formal Verification. 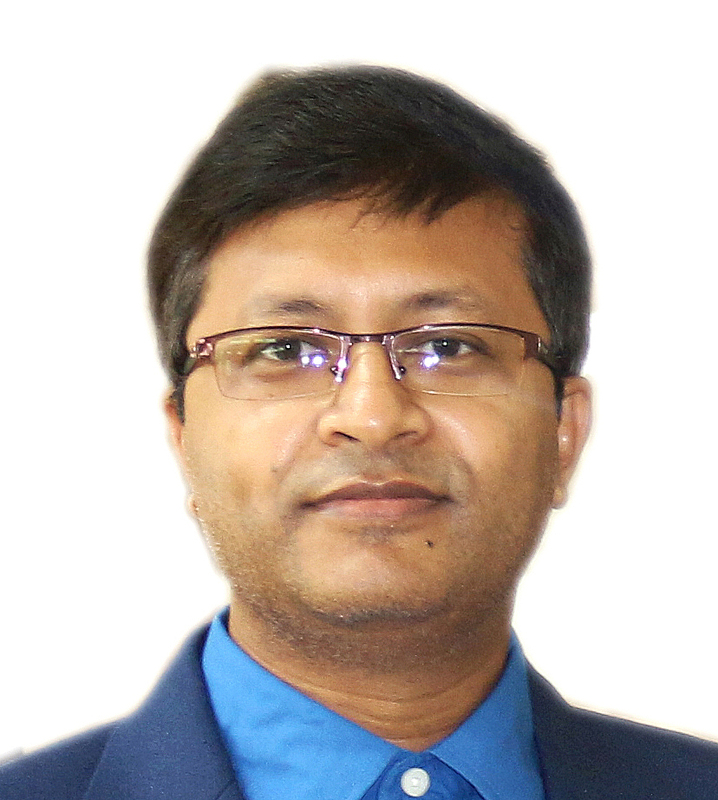 Due to the digitization of data in large scale and varying requirements of the organizations to serve different stakeholders, there is a need to compute, store and analyze large amount of data often in remote servers efficiently. Cloud computing provides a platform to compute, store and share data remotely for heterogeneous entities and provides services to them according to their demand. One of the major challenges in cloud computing platform is to ensure security and privacy of the data. The major limitation of applying existing cryptosystem such as AES, 3-DES, etc. is the need of decryption of ciphertext for outsourced computations that may violate data security. Homomorphic encryption is a solution which allows performing computations directly on cipher text without decrypting of the ciphertext. In this work, we develop efficient model to implement different algorithms related to benchmark computations on ciphertext. In addition, we work on parallel implementation of these algorithms. We also design cryptosystems with function level encryption, integration of Role Based Access Control (RBAC) with parallel Homomorphic encryption, and attribute based encryption to harden the security perimeter over remotely stored data. Mobile Ad hoc Network (MANET) has become popular as a key communication technology in many tactical and critical environments, such as military defence networks, disastrous and rescue operations, etc. The recent research on MANET focuses on developing security enforcement mechanisms integrated with routing protocols based on various trust models. In our work, we presented the limitations of the existing trust models in MANET on their applicability with varying contextual requirements and resource constraints with a simulation based comparative study with respect to their performance, and security enforcing features. With this comparative study, an adaptive multi-level trust model and routing protocol for MANET is proposed that supports heterogeneous applications with varying requirements and contexts. Our future work focuses on implementation of the proposed routing protocol for MANET in Software Defined Networking (SDN) platform to integrate and serve heterogeneous applications on a single SDN backbone network. 3. Texas Instrument Emulation kits for custom protocol design and testing. 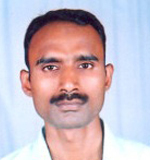 Collaborator: Anurag Lab, DRDO, Hyderabad. Software Defined Network (SDN) provides a platformto the users and network administrators to efficiently design,build, and manage networks by separating the control plane and data plane. SDN allows to program the control plane and configure the underlying infrastructure based on the applications, network services on demand. However, it introduces degradation of scalability and performance for real time traffic. 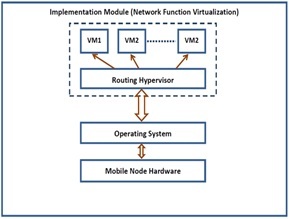 ThUS, it is important to analyse the limitations and performance of SDN controllers for implementation and deployment in live network environments with applications. 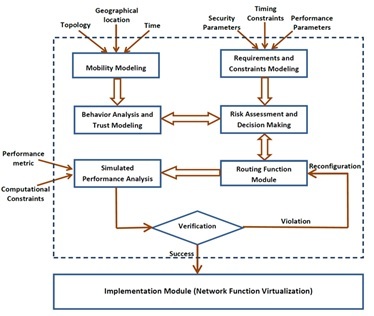 This work focuses on performance analysis of SDN controllers supported by simulations. We evaluate number of network virtualization technologies, models and tools to assess the performance of SDN controllers. 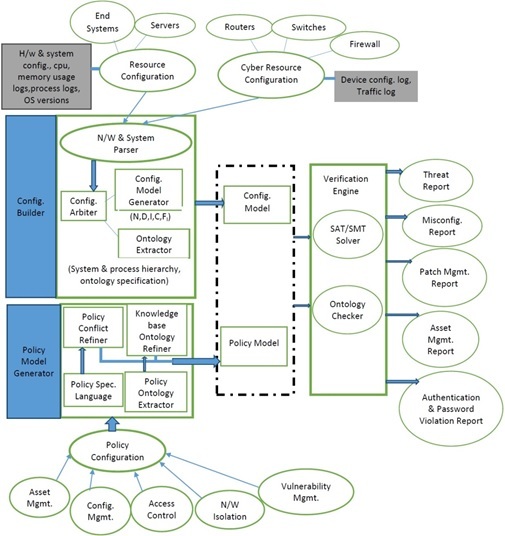 This study aimed at designing architectural blueprint and control algorithms for efficient SDN controllers with network function virtualization using in-house tools. Iteration of a meromorphic function with a single essential singularity is very rich as a dynamical system. We consider the map T_λ: z → λ + tan z on the complex plane. The set of points whose forward orbit is stable under initial (small) perturbation is called the Fatou set and its complement is known as the Julia set of the function . The Julia set of T_λ is found to be either totally disconnected or connected. A necessary and sufficient condition for totally disconnected Julia set is proved. When the Julia set is connected, it is seen that the Fatou set can consist of additional components, which can be completely invariant, a Siegel disk, a two periodic attracting domain or parabolic domain. Further, a necessary and sufficient condition is provided for the Julia set to be a Jordan curve passing through infinity. It is proved that the set of parameters corresponding to Jordan curve Julia sets is connected, shown blue in the base of the picture, whereas the set of those corresponding to totally disconnected Julia sets is disconnected, shown red in the picture. 2. 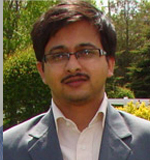 Tarun Kumar Chakra and Tarakanta Nayak, Iteration of translated tangent . Although Big Bang should have created equal amounts of matter and antimatter in the early universe, what we see around us is made almost entirely of matter. This leads to the inference that something must have happened to cause this matter anti-matter asymmetry. According to Russian physicist, Andrei Sakharov, Charge-conjugation-Parity (CP) violation could be one of the reasons for the same. We measure the amount of CP asymmetry seen in the decays of a particle called D-zero (D0) meson into final states of two neutral mesons, called K-short (K0S). This analysis was performed by Ms. Nibedita Dash, research scholar, School of Basic Sciences (SBS) and Dr. Seema Bahinipati, Assistant Professor, SBS in association with Dr. Vishal Bharadwaj, Inspire Faculty, IISER Mohali and Prof. Karim Trabelsi, Associate Professor, KEK, High Energy Accelerator Research Organization, Japan, using large data sample collected by the Belle Collaboration, KEK, Tsukuba, Japan using state-of-the-art analysis techniques. 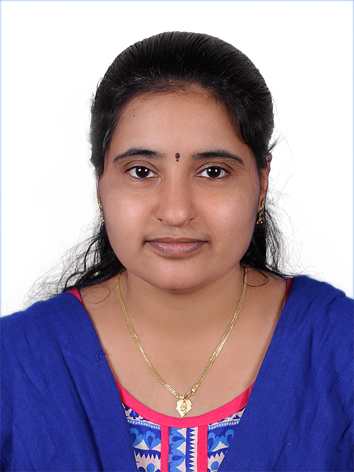 Nibedita presented her work in the 38th International Conference on High Energy Physics (ICHEP) held in Chicago in August, 2016 and garnered quite an attention of particle physics theorists and experimentalists with her precision measurement. This is the first research output obtained by the Experimental High Energy Physics Group of IIT Bhubaneswar. starts to probe the region of interest. The figure shows the distributions for the mass difference between D* and D0 D* decays to D0 pi. Left (right) plot is for D*+ (D*-). 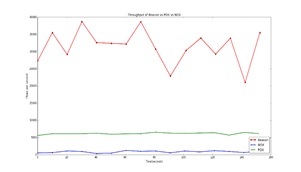 Points with error bars are the data, the solid curve shows the result of the fit, long-dashed (red) is for the signal, dashed (blue) is for the total background and dotted (cyan) is for the peaking background. How to approach Carnot Efficiency at Finite Power ? According to the second law of thermodynamics no heat engine can have an efficiency larger than Carnot’s efficiency. The latter can be achieved by the Carnot engine, which however ideally operates in infinite time, hence delivers null power. Increasing the power output of a heat engine has a corresponding cost in terms of reduced efficiency. Vigorous research efforts are being carried out in Science and Engineering, whether it is possible to devise a heat engine that outputs finite power at Carnot efficiency. Having the working substance near criticality (a second order phase transition point of the Van der Waals fluid) is an approach to the problem, exploiting either fluctuations, or a diverging heat capacity to argue for the maintenance of finite power . 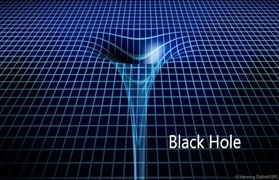 A working example of this feature was constructed in [1,2] in the context of holographic heat engines where the black hole in question is the working substance .